1) Two ships are sailing in the sea on the two sides of a lighthouse. The angles of elevation of the top of the lighthouse observed from the ships are 30° and 45° respectively. If the lighthouse is 100m high, find the distance between the two ships. Let AB be the height of lighthouse and C and D be the positions of the ships. 2) A ladder is leaning against a wall. It makes a 60° angle with the wall. If the distance between foot of ladder and wall is 5.5 meters, find the length of the ladder. Let BC be the wall and AC be the ladder. 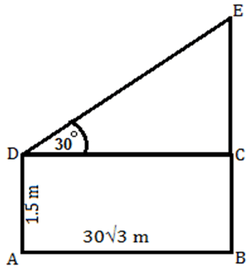 3) A man 1.5 meter tall is 30√3 meter away from a building. 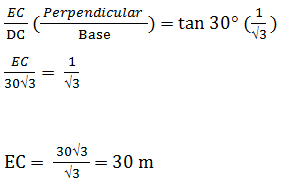 When he sees the top of building the angle of elevation is 30°. Find the height of the building? Let AD be the man and BE the building. 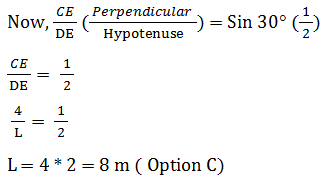 Now draw a line DC so that DC is perpendicular to BE. 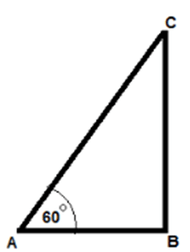 4) The angle of elevation of the top of a tower at a point X is 30°. 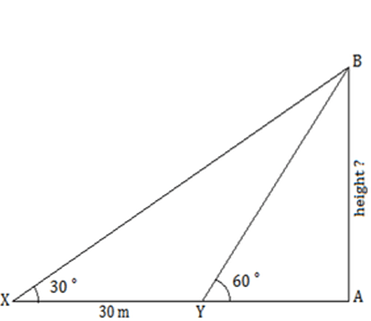 On walking 30 m towards the tower if the angle of elevation becomes 60° at point Y, find the height of the tower? 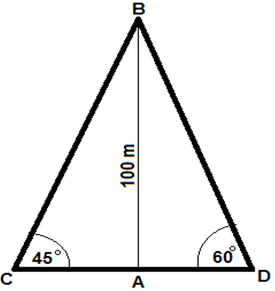 Let AB be the height of tower and XA be the distance between point X and base of tower. 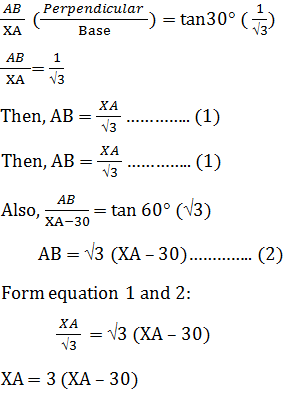 Put the value of XA in equation (1) to find AB (height of tower). 5) The tops of two poles are connected by a wire. The heights of the poles are 10 m and 14 m respectively. 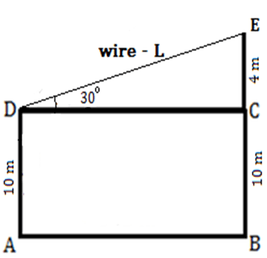 If the wire makes a 30° angle with the horizontal, find the length of the wire? Let AD and BE, be the poles of height 10 m and 14 m respectively.